So what does this mean for Vine? In the end, the competition should give users plenty to be excited about, whether you’re a Vine loyalist or an Instagrammaholic. And both apps will likely continue to thrive, as I’ve stated a few times already. Where Instagram’s user base is mostly made up of people documenting their feet, coffees, and pets, Vine has attracted a group of users who are pleased by the challenges set forth in the app. Instagram’s filters, longer video length, stability technology and already-ingrained user behavior will keep its video offering very similar to its photo offering. People will now just post videos of their feet, coffees, and pets. At the same time, Vine’s growing community of creatives and tinkering designers will likely continue to blossom, as well. Vine videos are approximately 6.5 seconds long, if we’re getting specific. Twitter and Vine put a lot of science and research into this length, determining that it’s the perfect length for video consumption, and forces the creator to think outside of the box in order to tell a story succinctly. It’s very Twitter-esque. Instagram video allows for 15 seconds of video, which could feel long for the Instagram video viewer, but roomy and quite comfortable for the creator. Well, both platforms let you shoot multiple, disjointed clips and string them together. However, Instagram will let users delete the last clip that they shot in a series, just in case it was a bad take. You are not allowed to delete the second clip in a series, without deleting the fourth and third first. In other words, you can only remove the most recent clip taken. Vine, on the other hand, doesn’t let you edit at all. Still, the founders this morning teased the ability to create multiple drafts within the app, which would allow for a little more freedom creatively. 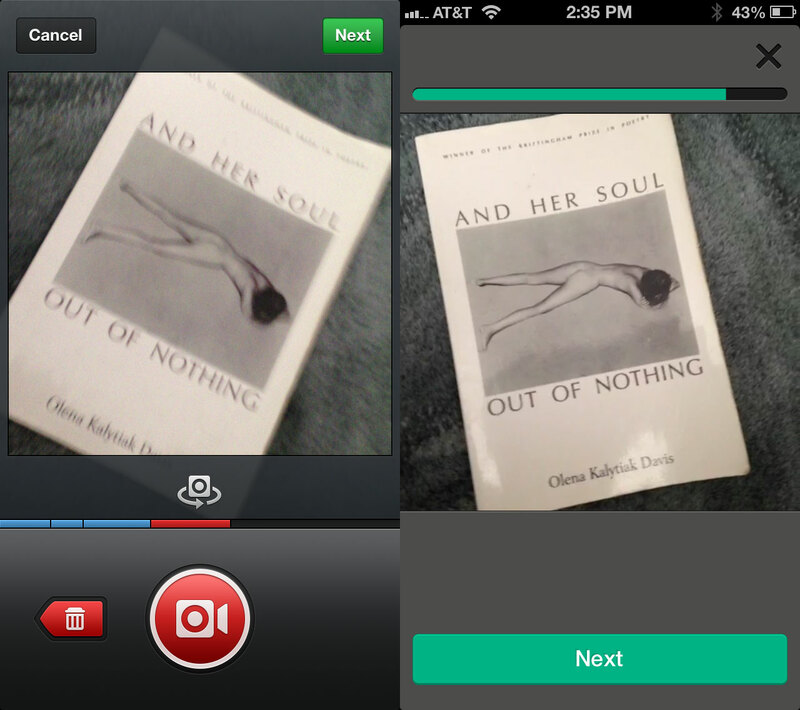 Neither Vine nor Instagram will let you pull video from your camera roll. Both insist that you shoot your Vineable or Instagrammable video within the respective apps. Sorry, folks. However, both apps will instantly save your Vined or Instagrammed clips to the camera roll for later use. They also have front-facing camera functionality in common. Both Vine and Instagram will let you switch back and forth between front- and rear-facing cameras while shooting. This feature was originally not available on Vine, but came in an update shortly after the app launched. Both apps also let you mention other users to tag them in a Vine. In true Instagram style, the Facebook-owned app has indeed provided filters for its new video-sharing function, and they’re brand new filters from the same old photo filters we’re used to. There are 13 new filters in all, and each of them are specifically designed with video in mind. Vine does not offer filters, and I don’t imagine that the app will do so anytime soon. It appears that Vine is still interested in giving creators tools to make interesting, beautiful moving imagery, but I predict that those tools will be in line with higher quality videos as opposed to more convenient creation. In other words, I expect to see features like voiceover, or perhaps a tool that helps creators make more seamless animation-style Vines, to land on the network. One feature that got a lot of “Oohs” and “Ahhs” from the press conference crowd was Instagram’s Cinema feature, which helps stabilize video shot within the app. Though image stabilization software is said to sacrifice image quality in other ways, most of the time, it shouldn’t be too much of a problem for Instagram’s ever-growing user base. Instagram filters, brightness settings, etc. certainly mess with a photo’s quality enough to begin with, but with the reward of looking tanner, or capturing an unnaturally blue sky. Vine has no such feature, or at the very least hasn’t mentioned anything like it. Sharing options haven’t expanded for either app, but Instagram has Vine topped on this front. 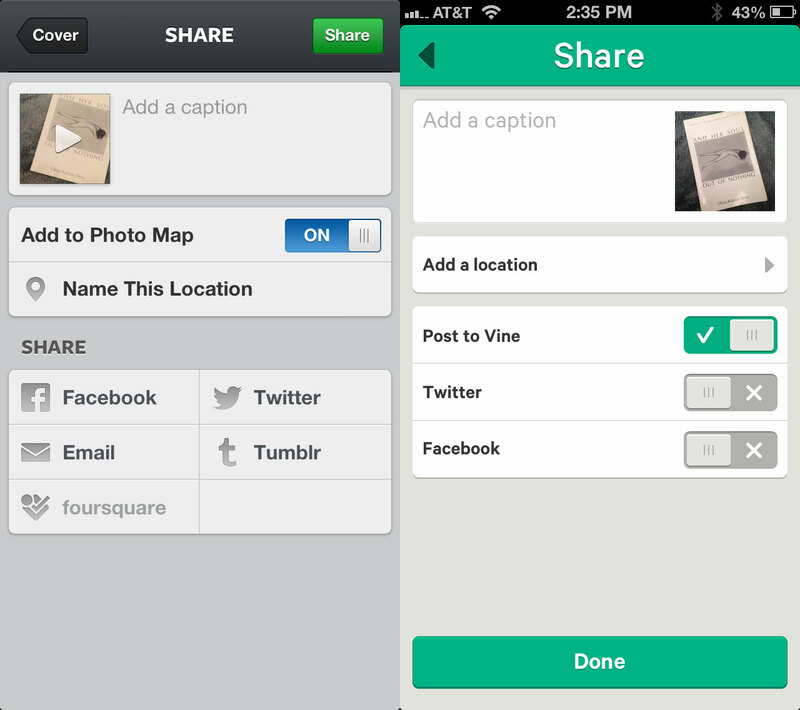 Where Vine only lets you share to Vine, Facebook, and Twitter, Instagram lets you share videos to Facebook, Twitter, Tumblr, Flickr, and foursquare, as well as through email. However, it’s worth remembering that Twitter’s Vine has full Twitter card support, meaning Vines display right in your Twitter stream. Systrom famously turned off Twitter Card support to push more traffic to Instagram.com back in December. Both apps let users geo-tag their locations, but only Instagram offers a photo map letting you surf users photos based on location. The Instagram stream remains much unchanged. Videos are still a perfect square, just like photos, but with a cute little camcorder icon adorning the top right corner. Both apps will autoplay videos, but Instagram seems to offer a little two-second buffer waiting for you to pause there in your stream before it plays. Vine is more quick-fire. Neither app has options for silencing video within the mobile apps, unless you turn sound off on your entire phone. On desktop, Vines can be muted. Instagram videos can not be muted. Vine has also offered users the ability to embed Vines via desktop, which is a feature Instagram did not include for on Instagram.com. Another, bigger difference with regards to consumption is the fact that Vine videos loop, while Instagram videos only play once. This gives Vines a more gif-like quality, especially when tethered to that shorter, six-second limit. Instagram videos are more of a story with a beginning and an end. It’s also worth mentioning that Vine’s stream may look radically different soon, though. Today’s tease of new UI tweaks showed a new, full screen layout for the Vine stream that removes the space normally held by likes and comments. 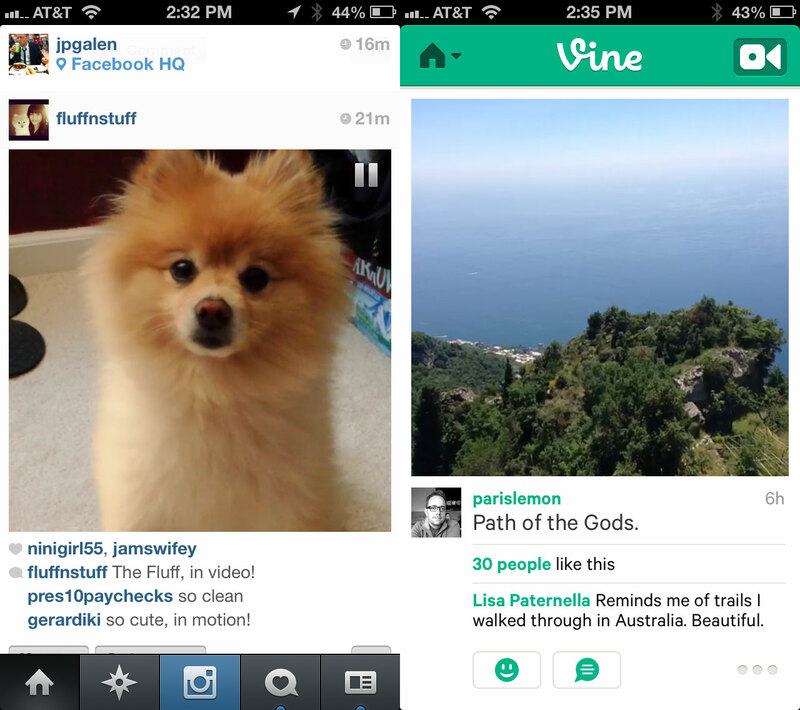 Vine already has a solid user base of video-sharing addicts. They craved snackable video-sharing before an app like Instagram could give it to them. The limits placed upon them by Twitter’s disposition towards brevity makes Vines that much more creative, and the looping aspect throws a dash of Gif into the mix. And we all know how popular Gifs are. That said, Instagram video will surely slow Vine’s growth to an extent. Instagram built a video-sharing product for the masses. There’s plenty of time to shoot a video, you can make it pretty with a filter, and they’ll even help you with a steady hand. But Instagram video’s mass market appeal only makes Vine’s niche, creative-focused breed of video-sharing that much more niche, and creative-focused. Time will tell how the two compete in the market, but in the meantime we should all grab a bowl of popcorn to watch the story unfold. Even if it takes a while, there are plenty of Vines and Instagram videos out there to wade through.